Last August 28th I had the opportunity to attend the first EOS Rio Meetup in São Paulo city at BandTec Digital School. 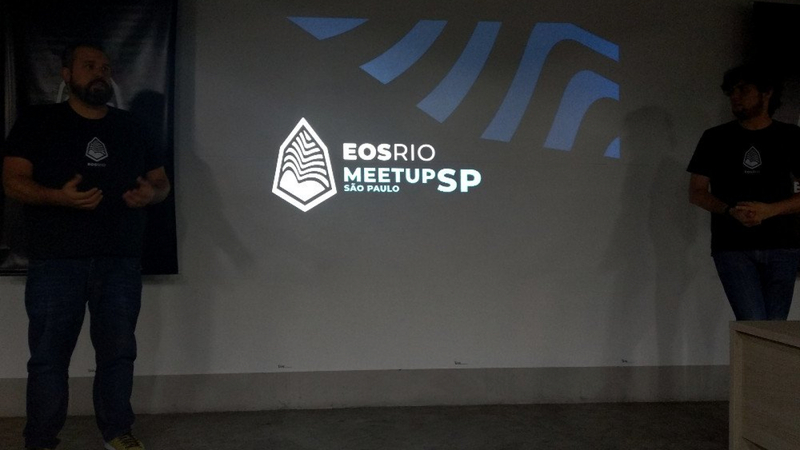 We were pleased to meet some of EOS Rio team members (Luiz, Dominique, Igor, Thiago), who introduced their work to an enthusiastic crowd of EOS fans, developers and promoters. EOS Rio team guided us through the different blockchain generations, the differences between POW (Proof-of-work), POS (Proof-of-Stake) and DPOS (Delegated Proof-of-Stake), what a Block Producer actually does on EOS and the main tools available today to entrepreneurs and developers aiming to build on top of EOSIO. We learned about Sidechains and its advantages (including the possibility of sharing Block Producers between parallel chains). One of the main focus of the conversation was Governance, a hot topic in EOS community right now. I attended the meetup with Ranulfo Paiva Sobrinho @ranulfo, my co-founder at BeSpiral and Julien Lucca, from our Development team. Together we had the amazing opportunity to introduce BeSpiral main concepts and structure (including a quick sneak peek of our beautiful brand new user interface… I’m such a #proudmom)… It’s so nice to have the chance to share our ideas and receive positive and constructive feedback from people also committed to solve big problems and create thriving communities. From left to right: Karla, Ranulfo, Thiago (EOS Rio) and Lucca. And… surprise! surprise! We got to know that BeSpiral is the first Brazilian dApp on EOS! such an honour to be taking the first steps on this journey, hoping to inspire many others to experiment and create with EOS powerful technology. The work that EOS Rio is doing is fantastic, developing the infrastructure but also a strong community eager to collaborate. We share their vision of cooperation in Latin America, towards building a solid knowledge base in Spanish and Portuguese about EOS technology, tools and emerging projects. Being from Costa Rica #PuraVida (I’m a happy Costa Rican living in Brazil) I had to get in touch with EOS Costa Rica @eos-costarica (another strong EOS Block Producer). After a positive and refreshing video chat with Edgar, Xavier and Gabo, I’m more than certain that the Latin American EOS community is full of possibilities. We love to be linking @eosrio and @eos-costarica, and looking forward to collaborate with these two amazing teams to spread the voice about EOS on the region. BeSpiral will also be one of Costa Rica’s first dApps (we are planning to start soon a pilot in Costa Rica and another one in Brazil, stay tuned), joining DMeetup, SmartGate and other Costa Rican initiatives. Many thanks to our sponsor Shuttleworth Foundation and our collaborators (Leo Ribeiro @leordev, Lucca and all our friends from Centurion-Cielo Blu) for joining us in this adventure. BeSpiral is an open platform that allows any group of people with a shared socio environmental purpose to design, launch and maintain their own cryptocurrency on blockchain, under their own rules and values. With BeSpiral communities will minimize negative consequences triggered by economic crisis, at the same time solving environmental and social problems. Do you want to know more about BeSpiral? Check out our website, follow us on Facebook and Twitter, (coming soon on Steemit) and stay tuned for our future posts about our vision, plans and future pilot communities.